I’ve got my first review of Video Rage! Yay! And it’s from my friend Katja, aka Kat Impossible, from the blog Life and Other Disasters. You’ve probably seen her comments on my posts once or twice on my blog. She’s got that really awesome black-and-white photo as her profile picture. Finally, Rami has a certain talent for ending a story. His epilogue always makes you wonder what will happen next and that’s basically what keeps you hooked in a book. Just wait till you read the third book! I’ve got an ending that I think will really surprise people. If you guys want to check out the full review, please click here. And if you like what you read, please feel free to leave Kat a comment with your thoughts. Also, if you’re interested in checking out Video Rage, or the first book Reborn City, I’ll post the links down below. And if you decide to get a copy of either book and you like what you read, please make sure to let me know. Positive or negative, I love feedback, and it ultimately helps me out as a writer. That’s all for now. Tomorrow’s Friday, so you know what that means. Until next time, my Followers of Fear! 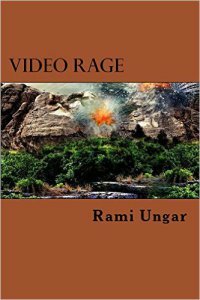 Video Rage: Amazon, Kindle, Createspace, Barnes & Noble, iBooks,Smashwords, and Kobo. Thanks Joleene. Have you started reading the first book yet?